Recently launched Galaxy Y Pro Duos B5512 get rooted. 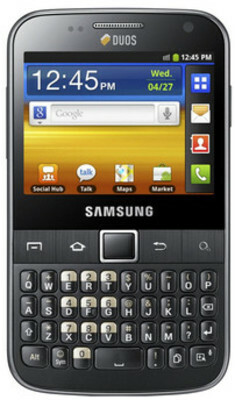 Samsung Galaxy Y Pro Duos has 832 MHz Scorpion Processor, 3 MP rear Camera, 0.3 MP front facing camera and runs on Android 2.3 Gingerbread OS. This phones comes with dual-SIM Dual active technology that allows users to be available on both GSM and CDMA at the same time. This tutorial help you to Root Samsung Galaxy Y Pro Duos. Now reboot your phone by going to “reboot system now” option. Once the phone is restarted, you can download Superuser application from Play Store to test whether root is successful or not. thanks i was looking for this a long time…….